Happy new year to everyone! A big thanks to those submitting games this month! Check out Tizoc Monthly highlights! Did you love Stardew Valley? Does Animal Crossing make you smile? Are you looking for a semi-relaxing game that can be played at your leisure? If you answered maybe to any of the previous questions then do I have a game for you! My Time at Portia is a charming 3D Pseudo-RPG Simulation game that recently left Early Access. As a young builder you move to a new land to take over your father's workshop for a chance at a new life. The game has a plethora of different features and activities. Meet and make friends with the town folk, complete commissions for money and fame, get married, decorate your house or build a farm with animals and crops, fish, explore dungeons and battle monsters with real time combat! There is a lot more where that came from but the sentence was getting long, so check out the free Demo on Steam and try it for yourself! You just played Yakuza Zero. You were blown away by it (right?). Well here's some more Yakuza goodness for you. Yakuza Kiwami is the remake of the first game on PS2 from 2005. It's actually quite remarkable how the structure of today's Yakuza's are to the very first game. Of course back then, there weren't as many side stories and mini games, so this remake attempts to make the overall game experience quite similar to the more modern Yakuza Zero. The main differences between Zero and Kiwami is that the main story is a bit shorter now, you only control Kazuma Kiryu and there are a few mini games missing from Zero not found here, such as Disco and Arcade Games. The game was released at a budget price and with a pretty quick turnaround in development time in Japan so I suppose at that time it was made for fans who loved Zero and wanted more. For those who haven't played Yakuza Zero, I'd recommend that one first and for those sitting on the fence on this series still, please give Zero a shot, you can beat bad guys, with a motorbike, and break his face against a car door, and then eat some ramen and go bowling and chill at a hostess club. Bioware's Anthem is the latest entry in the shared-world loot shooter genre, including The Division, Destiny, and Warframe. In fact, Anthem feels like the combination of them all, with heavy influence from Mass Effect in gameplay and mechanics. In Anthem, you’ll spend most of your time flying around in a robot suit called a javelin, killing and looting enemies along the way as you build your ultimate killing machine. Just like a Bioware game, there will be story to follow, but it won't be the main focus of the game. It's a loot shooter through and through, you start from the hub, customizing and maximizing your javelin, then you pick a contract or an expedition, and you'll arrive in the corresponding map. Explore the shared open world space where you can freely roam with others, hack n slash enemies with melee or shoot them with your big guns, exploit enemies' weakness and perform sick chain skill combos with your team mates to obliterate them. Sunless Skies, developed by Failbetter Games, is a Gothic Horror RPG/Naval Exploration/Choose Your Own Adventure. With the British Empire under the immortal Queen Victoria having conquered the Solar System, you play as the Captain of your own Steamship, sailing amongst the stars, exploring and seeking your own destiny. A very British game, Sunless Skies takes you on an adventure through the nightmares and glory of Victorian Britain, the conquests and science and exploration and oppression and exploitation. Failbetter’s signature focus on writing is the main focus here, weaving it’s tale of Empire and all the atrocities and stupidity fuelling the great machine. Also tea. So much tea. The Ace Combat franchise is back after seven years to the beloved fictional world of Strangereal. This world is similar to our own but with different historical events and landmasses, this allows the developers to create an interesting mix of RPG and military game unique to this franchise. The team of Ace Combat 04 and Ace Combat 5, two of the best games of the series has been brought back to work on Ace Combat 7: Skies Unknown, which goes back to the series roots and follows the story of the Onsean Federation (Onsea) and the Kingdom of Erusea, as the latter declares war on the former. 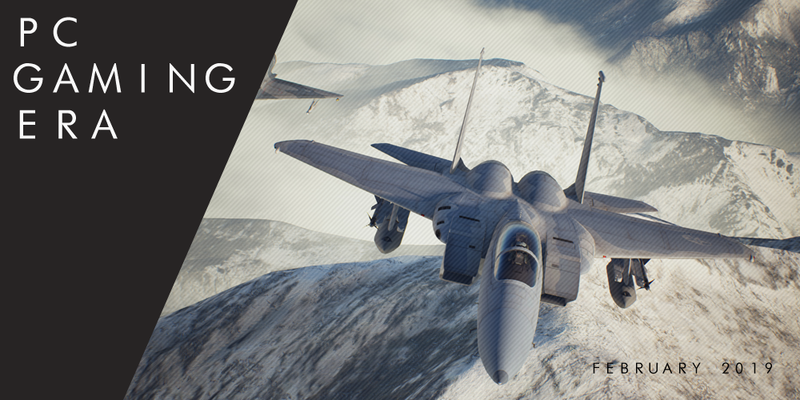 Ace Combat 7 allows players to further customize the great variety of aircrafts available by spending points earned in single and multiplayer modes for parts, which is one of my favourite aspects of the game. Both modes are fun to play and the multiplayer features a Deathmatch and a Battle Royale mode, the latter being 8 players facing each other in a free-for-all deathmatch. To sum up the game satifies both returning veterans and new players alike with its story and thrilling aerial fights. Hard West is a turn based tactics game with a wild west setting. Control Warren as travels the western frontier seeking revenge against the demonic forces that destroyed his life as he recruits allies to his cause along his journey. The game consists of 8 main scenarios and has various difficulty options allowing you to tweak the gameplay to your preference whether you want to make your experience easier or harder. The main goal for this challenge is to simply complete the main game's scenarios. It’s February, and that means Valentine’s Day, and what better way to celebrate that by spending some quality time with your waifu? Get the ‘Starting a New Life’ or ‘Lord of the Night’ achievement in Catherine! That's everything I think, give a shout if I've missed something, have a good moth everyone! 1 month closer to the Summer Sale! PS. I should have wrote a recommendation for My Time at Portia. Everyone get on that. Still not too late! Send one my way. I saw a copy of The Wolf Among Us for Steam for 8 dollars! Worth it at that price? I know it's no longer available on the market so I'm curious. It's new! it's amazing! It's a February Thread! Please take part in out our PC gaming Era GOTY awards! MRORANGE Wonderful thread, thank you! Will do, I will PM you in a bit. Yes it's worth it at that price, but the game is still up on Steam. Oh! I thought it was removed during the Telltale problems! I have it on Xbox Live Gold but I want to have a copy on Steam to own. Hoping for another great month. No need for that snarky subtitle, really. It's just a mock to a single poster and would only make this community look bad. In our heart of hearts we know we are computer cowboys. Thread subtitle should have been "Toxic Pro-Consumer Computer Cowboy Finally Free From Valve". I am really excited to play Super Daryl Deluxe from the Humble Monthly, it looks right up my Metroidvania alley. Foundation is now up on Steam Early Access for 26.99. It’s a medieval city sim builder. Anyone else getting it? It looks interesting. I recently added it on my wishlist on GOG. Both 'computer cowboy' and 'toxic pro-consumer' came from a single person. People were suggesting either or the combination of those for the subtitle. This year my Steam season card strategy completely backfired. Looks like I'll have to craft the sets and get rid of repeats. Nathan came up with toxic pro-consumer, while computer cowboys came from some idiot in the RE2 demo thread I thought? Yes. Each came from a single person, as I said. Maybe I worded that wrong above. Give me more arcade ports Capcom/Sega/SNK/Namco/Taito/Midway! No competition. Should be the thread title. Personally, I'd rather this thread cooled off of its Steam vs. Epic stuff. It's beyond tiring to see the same things relitigated in literally every thread related to either Steam or Epic's store. If this is to be a PC gaming thread, it shouldn't just be about your preferred PC gaming client. It completely stifles other PC gaming and gaming news discussion and, I imagine, only serves to drive people away from the thread. It isn't a case of being about your "preferred client". GOG, itch and others are welcome to be discussed here. Steam is the most discussed only because Steam is the biggest platform on PC and this community evolved from the old SteamERA community. Epic doing their hardest to remove a lot of the things people like about PC gaming would of course be criticized here, and it's kind of the big news story at the moment.